After years of waiting, I finally picked my pineapples! I planted those silly things a little under two years ago but it felt more like a millennium. It felt like they would never grow. This may not have been entirely their fault…The plants have moved around the island with me and survived months of “benevolent neglect” from my father and brother while I worked on the mainland. They were hit by the gardener’s weed wacker, allowed to dry up almost completely, and thrown in the back of a pickup truck. One could say that I was cruel to those poor little plants but I think they were just fine. I left them at my father’s house on the North Shore for a few months when I moved to the city but finally brought them to the new house this winter. They immediately grew like crazy! The climate must be perfect for them because within a week of being set in my yard and promptly forgotten, they started to flower. (See my most recent Garden Update to find out what plants are doing well or….not so well…in the Kaimuki heat.) They grew very quickly, doubling in size about every two weeks for the first couple of months. Then stopped getting bigger. I had no idea when they would be ready. A friend told me that the top leaves would be easy to pull out when they were ripe but they never got any easier to pull. Finally, I just picked them. It felt like the right time. I ended up picking them for my Dad’s birthday party. That dinner, I put all my culinary cred on the line and made a dinner of things that I wasn’t sure how they would turn out: lasagna totally from scratch, my first batch of sourdough, pineapples that I wasn’t sure were ripe. If any element had turned out badly, I would have ruined dinner, I didn’t have any backup plans. I was lucky, everything turned out great. So good that we forgot to eat the pineapples. After the months and months of agony, I freaking forgot to eat them! At the end of the night, I took one home and left the other for my Dad to eat. It sat in the kitchen for a long time. I wasn’t sure what to do with it. I wanted some special occasion to eat them. One never came. Finally, I decided that they would go rotten soon if I didn’t eat them and made this pineapple salsa to go with my spicy pork belly lettuce wraps. It turns out the pineapple was so darn good I didn’t need a special occasion to eat it — eating it WAS the special occasion. Perfectly sweet and tart. Golden and juicy. All around perfect! It turns out, sometimes a good dish doesn’t require anything more than itself to make an evening. My pineapples reminded me to just embrace a moment for what it is instead of trying to fit it into something else and just let things happen – a perfect reminder for cooking and for life! Make something special today. You don’t need a reason. Let the food speak for itself. 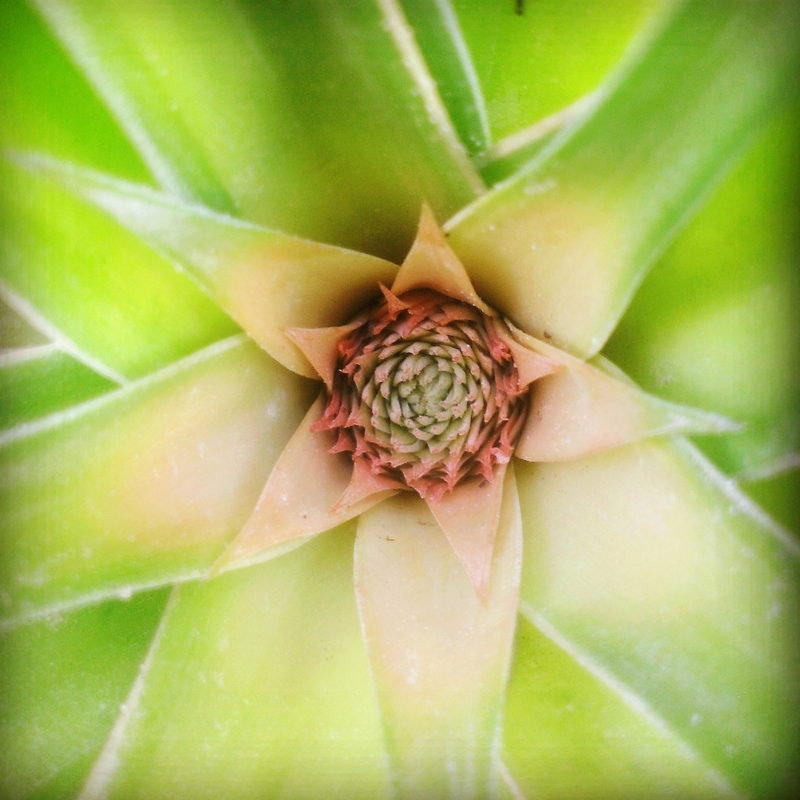 Homegrown pineapple – so good! This looked so tasty that I ate my phone. Beautiful Molly, maika’i maika’i no ou!! It looks so fresh and cheerful! That cute pineapple is perfect! I know, there is nothing as joyful as eating the food you grow. Enjoy!